• Publisher: BenBella Books, Inc.
For a new business concept, there is a balance between start-up delusion and honestly evaluating risks and rewards. For every business idea that was shot down for being impractical, there are others who persisted and bucked the odds handed to them by self-proclaimed experts. Moomers Ice Cream outside of Traverse City is a great example. Their original idea for opening a destination home-made ice cream location was criticized by some experts for being located too far off the beaten path. If they had listened to the sage advice given to them in those early days, they likely would have become another dusty business plan on a shelf. If there was ever a blunt wakeup call for the aspiring small business owner, “The Entrepreneurial Equation” by Carol Roth is it. Roth is well known for her commentary and contributions in major radio, television, and print outlets, specifically in the areas of small business development. In her latest offering, she methodically goes through the reasons people give for wanting to start a business. 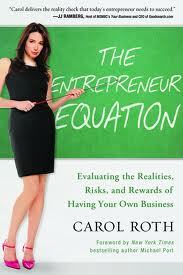 Roth uses plenty of lessons that eat away at the pervading myths of both successful entrepreneurs (IE. Bill Gates had expertise and had plenty of help along the way) and the way our society views the alleged freedoms of small business ownership. Roth’s well presented self-assessment process confronts both the question of: “Is entrepreneurship for you?” but also” Are you right for entrepreneurship?” This includes sections that address one’s motivation, timing, and personality to leave one’s job and venture off on their own, as well as assessing the potential opportunity, risks, and rewards of the business opportunity. The strength of Roth’s writing lies in her honest and at times confrontational approach that essentially tells it the way it is. To her credit, Roth uses historical perspective to show not just the myths of self-employment but also how in today’s hyper-competitive world, it is even more difficult to make it on your own. What results is a book that asks all of the questions that one has to be honest enough to ask before even considering starting a business. The reality checks force one from their own perspective, to consider the perils and rewards of business ownership. Roth’s exercises are invaluable and focus on both personal and business related issues that any solid assessment would require. These include gut wrenching summaries of hard work, personal/family responsibilities, hobbies turned into jobs, working for customers instead of a boss, managing employees, and that essential thing called cash flow. Surviving this boot camp of a book means the reader has also saved “…money, time and effort by avoiding business ownership when the time isn’t right for you”. At the same time, the “Entrepreneur’s Equation” also provides many of the tools that that those going forward will need to be a business success. In an environment where starting one’s own business is touted as both an opportunity to get rich and the ultimate fulfillment of the American Dream, “The Entrepreneurial Equation” will appear to be downright pessimistic. What gets lost in the pessimism are the other parts of the book that rigorously details the essential due-diligence that any business owner should review before learning the hard way. The bottom line for readers considering self-employment is a book that will erase many illusions of start-up grander. The question then becomes: Is your idea and personality strong enough to pursue the business concept knowing all of the potential pitfalls? Chris Wendel is the Regional Director for the Michigan Small Business & Technology Development (MI-SBTDC) based out of Traverse City. The MI-SBTDC serves established companies and aspiring entrepreneurs with one-on-one business counseling, market research information, and small business training. For further information on the MI-SBTDC call 231.922.3780. This entry was posted in book reviews and tagged Business help northern michigan, business in Traverse City, Business start up, entrepreneurial, growing your brand, small business assistance, starting a business in northern michigan, Traverse city business counseling. Bookmark the permalink.